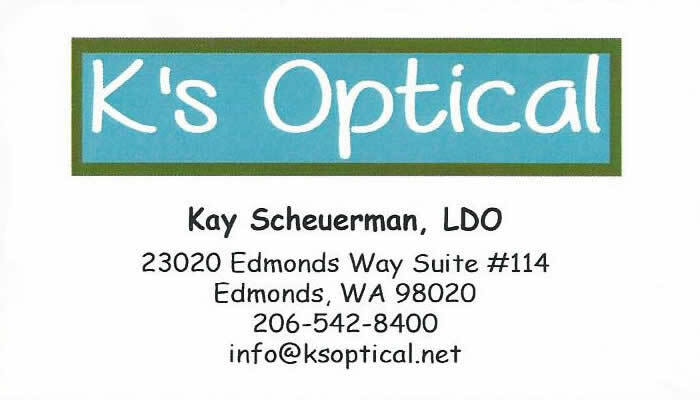 We are located at the NW corner of Edmonds Way and 232nd St SW at the flashing yellow light. Our parking lot entrance is the on 232nd St SW. Turn at the flashing yellow light and enter the first driveway on the right. We are located in a secured building. Enter 789 on the call box at the parking lot entrance for access or use our main entrance on Edmonds Way. © K's Optical. All rights reserved unless otherwise noted. Site design and hosting by JomPress..